Nearly 6,000 pedestrians were killed in car crashes in the United States in 2017, the second straight year with numbers not seen in over two decades. The Governors Highway Safety Association released a report this week that listed 2,636 total pedestrian fatalities in the first half of 2017. Projecting that over a full year, the tally is basically unchanged from the 5,987 pedestrian deaths in 2016. Pedestrians now account for about 16 percent of all motor vehicle deaths, compared with 11 percent just a few years ago. In Washington state, 44 people were killed as pedestrians in the first half of 2017, a 22.2-percent increase from 2016. In November 2016, Seattle city officials dropped speed limits on arterials from 30 to 25 mph as part of its Vision Zero safety plan launched in 2015. The plan hopes to end traffic deaths and serious injuries on city streets by 2030. According to the city, pedestrians hit by vehicles going 25 mph are half as likely to die as those hit at 30 mph. The report also looked at the link between legalized recreational marijuana and pedestrian fatalities. 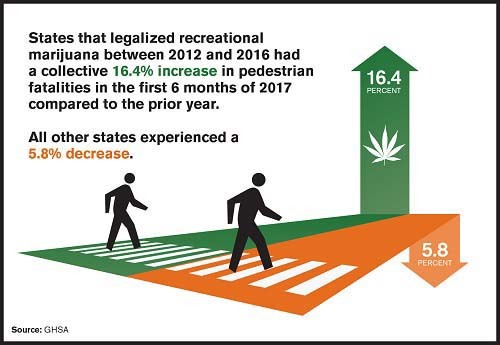 It states that the seven states and Washington, D.C., that legalized recreational marijuana use between 2012 and 2016 experienced a collective 16.4 percent increase in pedestrian fatalities for the first half of 2017, while all other states saw a combined 5.8 percent decrease. In 2012, Washington became the first state to legalize recreational weed. The link between smartphone use and pedestrian fatalities was also examined. The reported number of smartphones in active use in the U.S. increased 236 percent from 2010 to 2016, and the number of cell phone-related emergency room visits is increasing as the devices become more prevalent in daily life. The distracted driving and distracted walking problems that we looked at last year now have data to back them up. The GHSA report does not find or imply a link between marijuana, cell phone use and pedestrian deaths. 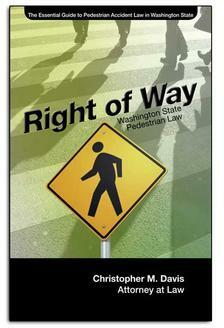 But those factors impair judgment and attention necessary to safely operate a vehicle and walk near roadways. While there are circumstances in which a pedestrian is at fault for an accident, most pedestrian victims in roadway collisions are the most deserving of compensation for their injuries. The pedestrian is usually the party least able to avoid a collision. Some research has shown that more pedestrians are involved in traffic collisions while crossing at an intersection than any other location. The pedestrian accident attorneys at Davis Law Group, P.S., skillfully handle any type of roadway collision case with a pedestrian victim. For any type of pedestrian accident claim in Seattle or across Washington state, contact attorney Chris Davis and the legal team at Davis Law Group for a free case evaluation with knowledgeable and experienced pedestrian accident lawyers.